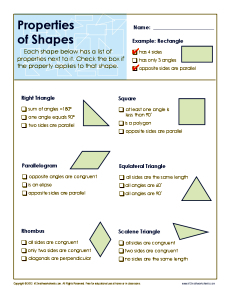 Your student will explore the properties of different shapes in this worksheet. He'll decide which properties apply to each two dimensional shape. Use it for practice for Common Core Standards for 5th grade Geometry, or for other students as appropriate.